Payment can be made by card over the phone or by direct bank transfer. Guests are required to pay a 20% non-refundable deposit to book the property with the remaining balance due 6 weeks before check-in. If the stay is less than 6 weeks away guests will be required to pay in full to secure the booking. 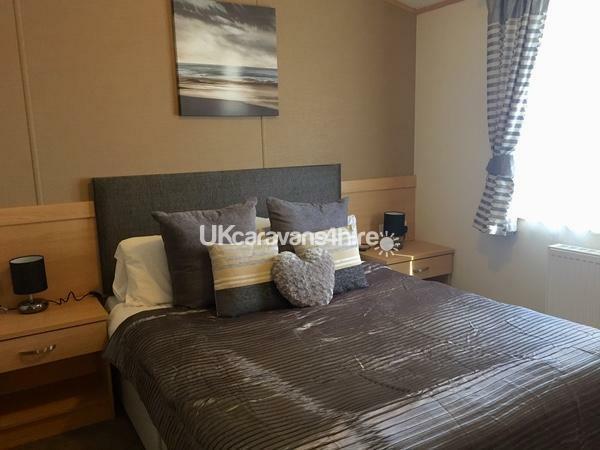 Guests are also required to pay a £150 refundable damage deposit in additon to the booking cost which is refunded after the stay if there has been no damage or issues. We reserve the right to retain all or part of the damage deposit should anything be damaged or require intensive cleaning. - a 50% refund of the total cost if they cancel at least eight weeks before check-in. These terms and conditions (the “Booking Contract”) are between and shall bind the property owner or manager (“we”, “us” and “our”) and the holidaymaker(s) who book our property (the “Property”). Each such booking is referred to in the Booking Contract as a “Booking”. References to “you” or “your” are references to the person making the booking and all members of the holiday party. Any Booking is subject to the Booking Contract. This Booking Contract and our confirmation email contain the entire agreement between us and you and forms the basis of your agreement with us so please read them carefully. Nothing in this Booking Contract affects your usual statutory rights. Please complete the enquiry form to request a quote or book the property. The Booking shall be made and this Booking Contract shall be effective once the booking fee and the Initial Deposit (as defined below) or full payment has been received and you have received an email confirming the Booking. You shall be required to pay the applicable damage deposit (the “Damage Deposit”), as set out in the email confirmation as part of your payment in full or your Balance payment (as applicable). Where you have only paid an Initial Deposit, you are required to send your payment for the Balance and the Damage Deposit within a certain period prior to the arrival date specified in the email confirmation (the “Arrival Date”). If you fail to make the balance payment due to us in full and on time we shall be entitled to treat your Booking as cancelled by you and the Cancellation Policy (as defined below) shall apply. If you need to cancel or amend your Booking you must write to us or email us as soon as possible. - you do not arrive at the property within 24 hours of your arrival time without notifying us, then we shall be entitled to treat your Booking as being cancelled by you and the Cancellation Policy shall apply. If this does happen, we will contact you as soon as is reasonably practical and inform you of the cancellation or the change to your Booking. If we cancel your Booking, we will refund you any fees already paid to us including any deposit. However, we will not be liable to refund you for any fees you may have paid to any third party in connection with your holiday (including, without limitation, fees for travel, entertainment, activities or insurance). You can arrive at the Property after the time specified by us on the Arrival Date for your holiday and you must leave by the time specified by us on the departure date we give you. We will let you know these times in writing in advance of your stay. If your arrival will be delayed, you must contact the person whose details are given on the booking confirmation email so that alternative arrangements can be made. If you fail to do so you may not be able to gain access to the Property. If you fail to arrive by midday on the day after the Arrival Date and you do not advise the contact of your anticipated late arrival we may treat the Booking as having been cancelled by you and we shall be under no obligation to refund you for fees already paid to us. 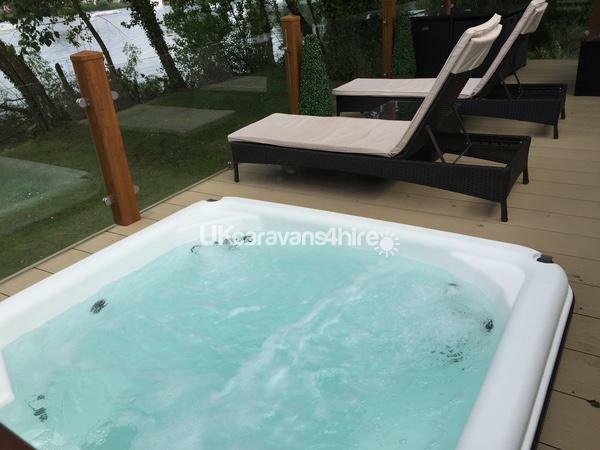 You agree to comply with the regulations set out in any property manual at the Property including use of the hot tub and wifi and any other regulations reasonably specified by us from time to time and ensure that they are observed by all members of your party. You agree to keep and leave the Property and the furnishings, including items such as kitchen equipment, crockery and glasses clean and in good condition. You agree not to cause any damage to the walls, doors, windows or any other part of the Property nor to do anything that may be reasonably considered to cause a nuisance or annoyance to us or to any other occupier of adjoining or neighbouring properties. You agree to take all necessary steps to safeguard your personal property while at the Property. You cannot allow more people to stay in the Property than expressly authorised, nor can you significantly change the makeup of the party during your stay in the Property, nor can you take your pet into the Property unless permitted by us in writing in advance. If you do so, we can refuse to hand over the Property to you, or can require you to leave it. We will treat any of these circumstances as a cancellation of the Booking by you and we shall be under no obligation to refund you for any fees already paid to us in those circumstances. Any refund will be at our sole discretion. You agree to allow us or any representative of ours access to the Property at any reasonable time during your stay for the purpose of essential repairs, in an emergency or to ensure you are complying with this Booking Contract. It is essential that you contact us if any problem arises so that it can be speedily resolved. It is often extremely difficult (and sometimes impossible) to resolve problems properly unless we are promptly notified. Discussion of any criticisms with us whilst you are in residence at the Property will usually enable any shortcomings to be rectified straightaway. In particular, complaints of a transient nature (for example, regarding preparation or heating of the Property) cannot possibly be investigated unless registered whilst you are in residence at the Property. If any complaint cannot be resolved during your holiday, you must write to us or email us with full details within 28 days of the end of your Booking. For the avoidance of doubt, you shall always contact us if you have any complaint in relation to your Booking or the Property. Our maximum liability for losses you suffer as a result of us acting in breach of this Booking Contract is strictly limited to the amounts received by us in relation to your Booking. We shall not be liable for any losses which are not a foreseeable consequence of us breaching this Booking Contract. Losses are foreseeable where they could be contemplated by you and us at the time your Booking is confirmed by us. Your Booking is made as a consumer for the purpose of a holiday and you acknowledge that we will not be liable for any business losses howsoever suffered or incurred by you. This Booking Contract (including any non-contractual obligations arising under or in relation to this Booking Contract) between you and us is governed by the law of England and Wales and we both agree that any dispute, matter or other issue which arises between us will be exclusively dealt with by the Courts of England and Wales. You may not transfer your Booking or any rights and responsibilities under this Booking Contract to any other person, without our prior written consent. If at any time any part of this Booking Contract is held to be unenforceable for any reason under any applicable law, that part shall be deemed omitted and the enforceability of the remaining parts shall not in any way be affected by that omission. This Booking Contract, together with the Cancellation Policy and our confirmation email contain the entire agreement between us and you relating to the Booking and shall supersede any previous agreements, arrangements or discussions between you and us, whether oral or in writing. No representation, undertaking or promise shall be taken to have been given or be implied from anything said or written in negotiations between you and us prior to receiving the confirmation email except as expressly stated in this Booking Contract. Neither you nor us shall have any remedy in respect of any untrue statement made by the other upon which that party relied in entering into this Booking Contract (unless such untrue statement was made fraudulently) and that party’s only remedy shall be for breach of contract as provided in this Booking Contract. Please advise number of guests and whether you wish to bring a pet to stay. We usually allow one well behaved dog as long as it is kept off beds, sofas and furniture and is not left alone in the lodge. 22 Rudd Lake, Tattershall Lakes Country Park, Lincolnshire. 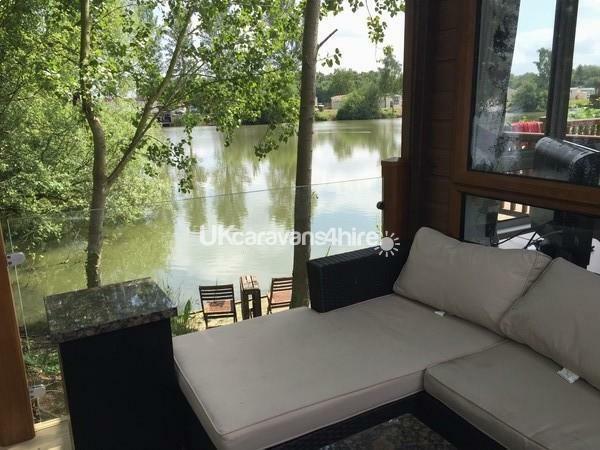 This detached holiday lodge with hot tub, WIFi and Xbox is set lakeside within Tattershall Lakes Country Park, in the heart of Lincolnshire. 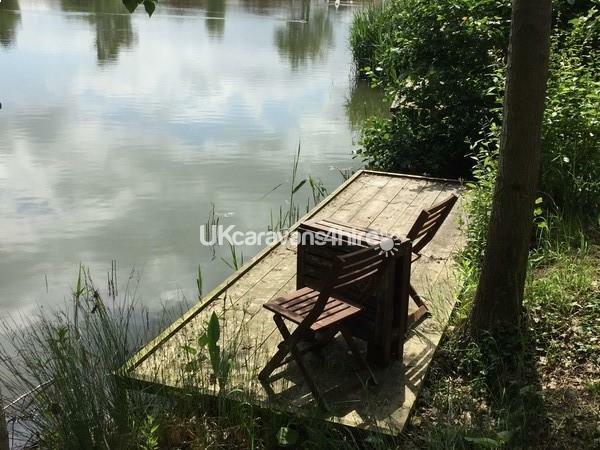 Overlooking a quiet corner of one of fishing lakes, this modern lodge is perfect for families and friends to enjoy the extensive on-site facilities and relax. 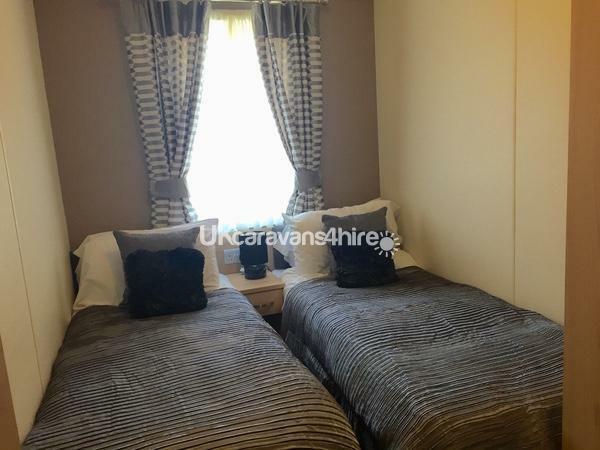 Offering excellent ground floor accommodation, with central heating throughout, this lodge has three bedrooms all with free view TVs: 1 x king size with dressing area and en-suite shower, basin and WC, 2 x twin rooms, Family bathroom with bath and shower over, basin and WC. 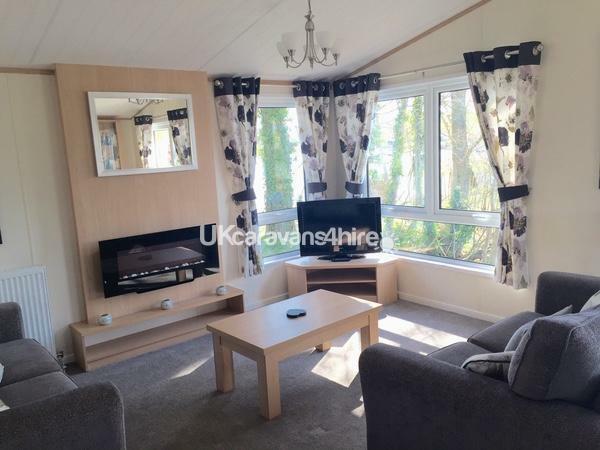 Spacious open plan living area with well equipped kitchen with full size fridge and freezer, microwave, dishwasher, oven and hob, dining area, comfortable seating and electric fire, Freeview TV, DVD , WIFI and XBox. 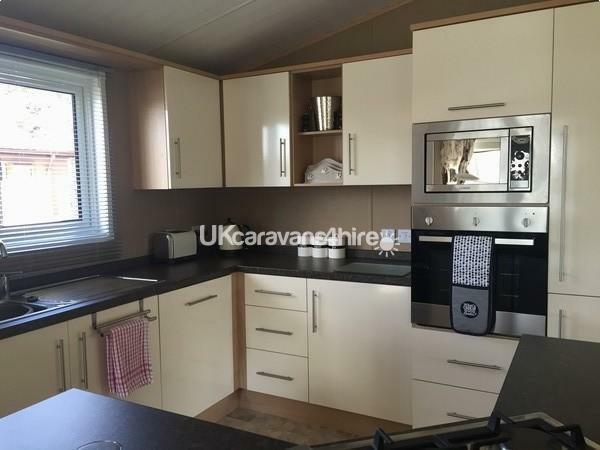 Useful utility room off the living area with additional WC, sink and washing machine. 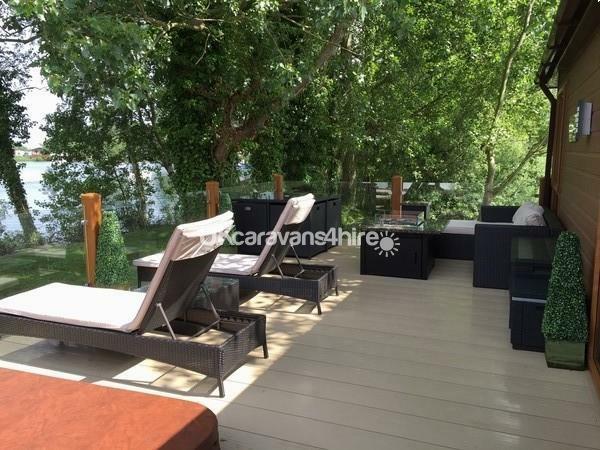 Patio doors opening onto the front decked veranda with seating and large private decking to the side with hot tub to take in the wonderful lakeside views. You can relax and enjoy a pampering session at the nearby spa or if you're feeling more energetic, there is water skiing, jet skiing, wake boarding, a gym, and indoor swimming pool. A well-placed luxury lodge for a wonderful holiday or short break. Is this lodge booked for the dates you require or do you want to visit with friends so need more space? 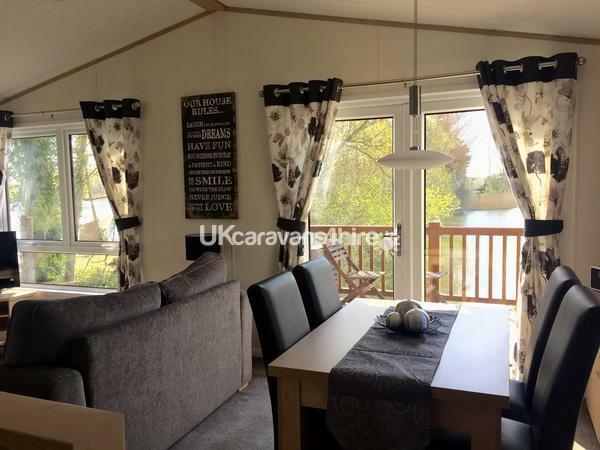 Check out our other Lakeside Lodges with Hot tub and WIFI next door to each other at 14 and 15 Misty Bay or our 3 bedroom caravan with Fishing and WIFI at 60 Fishing Lake. 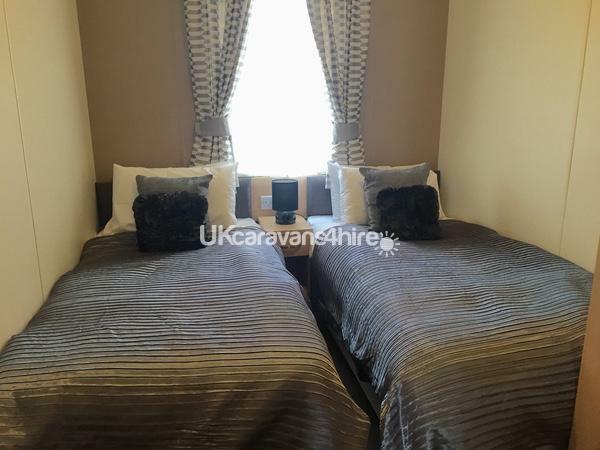 Fuel, power bed linen and towels included in rent. Off road parking for 2 cars. Private, verandas with furniture. 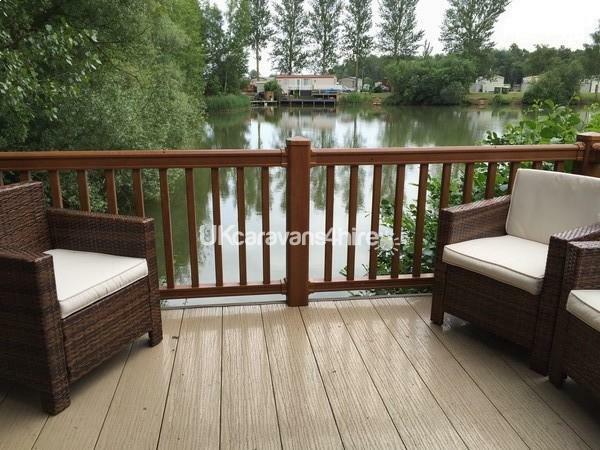 Extensive, communal grounds with lakes etc. One well behaved dog allowed if agreed with owner prior to booking but must be kept off furniture and beds and not be left alone in the lodge. On-site shop and bar/restaurant 5 mins walk. Note: Fenced veranda close to lake edge, children must be supervised at all times. RAF base nearby - there may be some associated noise. Check in 4pm, check out 10am. WIFI is now available and included in the booking cost. This can only be used for internet browsing and emails, not Internet streaming or downloading. Excessive use will be charged and deducted from the security deposit. 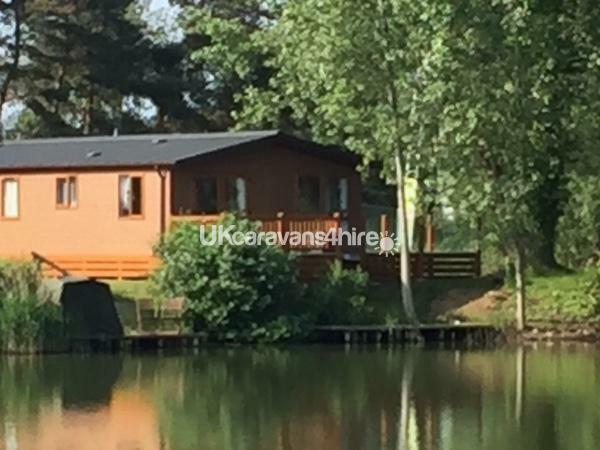 Tattershall Lakes also offer free wifi available on the park, guests can also upgrade to premium Tattershall Lakes wifi during their stay if they wish to download or stream. This is payable locally and is not included in your booking. 2, you must shower before use, to remove all fake tan, makeup and body lotions, these wreck hot tub water and it will look like pond water very quickly. 3, maximum bathing time is 15 minutes, it is not a swimming pool or bath your skin/health will suffer if you stay in longer. 4. The hot tub must be respected no drinking/smoking or fooling around whilst in the tub. 5. at the end of your session the hot tub must be refilled with water so the top jets are covered to ensure it continues to work and filter. Please note that park facilities inc swimming pool are usually open between March and December and Tattershall Lakes Country Park will require you to purchase activity passes in order to access some of their facilities i.e. swimming pool, entertainment centre and bars These can be purchased from Guest Services on arrival or at any time during your stay. Prices vary at peak times and are subject to change so please contact the park directly to find out specific costs for your party for the dates you wish to stay. Please note that the park carry out essential maintenance and park development during the winter months. During winter 2018/2019 the park are extending the entertainment complex to include a fantastic indoor splash zone and Sky Bar which will be open from Easter 2019. Unfortunately that does mean the indoor swimming pool, spa and gym will be closed between 1st January to 31st March 2019.